The cumbersome and ungainly, always a personal passion. The more I explore the decorative and fine arts, architecture, music, or fashion, the more drawn I am to the overwrought, the over-stated. WHEN I worked, I would inwardly cringe as a client , most often a second tier designer, would pedantically explain to me “that less is more” ; code for “we haven’t the budget”. 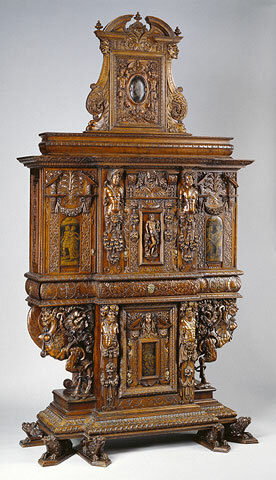 Several years back, 2005-2007, the Getty Center, presented a show, “A Renaissance Cabinet Rediscovered”. They bent over backwards trying to claim the legitimacy of a piece that Getty purchased ages ago. 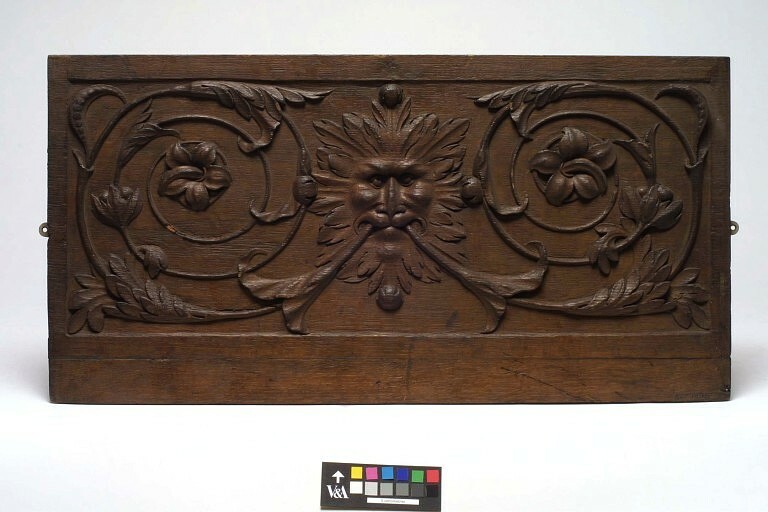 His advisors claimed it was a fake, he went with his gut, and it is now believed to actually be 16th cent. with late 19th century additions. I didn’t particularly care, I would have actually preferred the 19th century fake. I love how the Renaissance was interpreted in the mid to late part of the century. 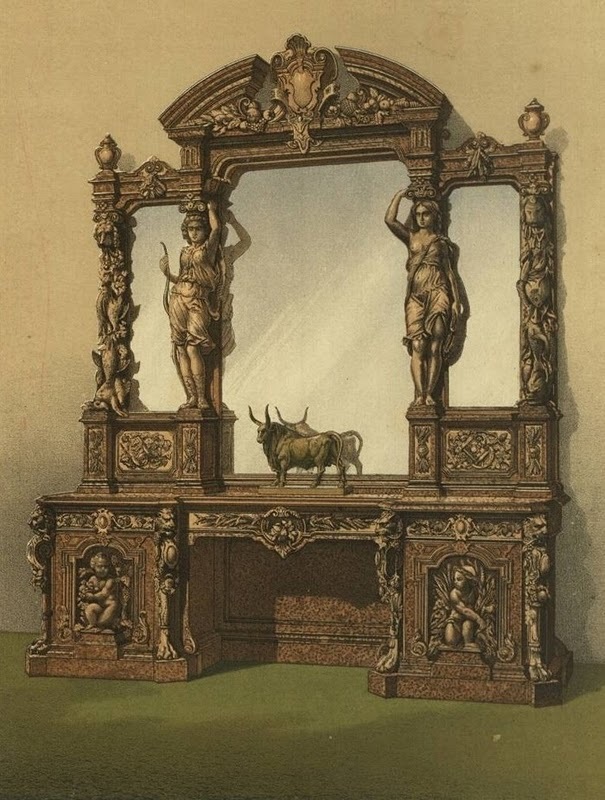 The monumental sideboard, the darling of the social climbing nouveau riche, was often based upon designs inspired by the architect, sculptor, designer, Hugues Sambin of Dijon. 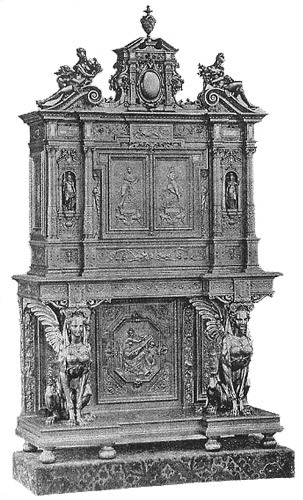 The following are a few of his wildly inventive designs. I searched for pieces attributed by Sambin and came up rather short. I will explore in more depth. 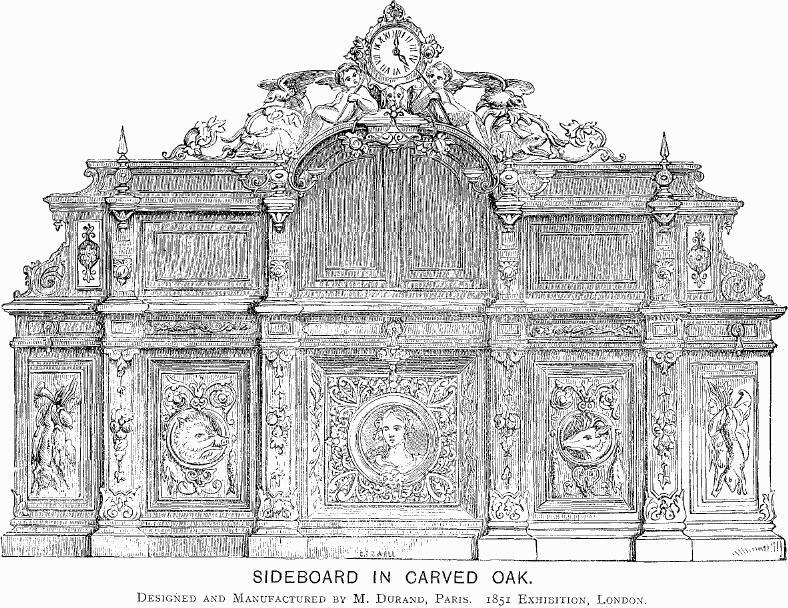 I predict I will enjoy the renderings more them the finished carvings if the following panel is any indication. Now on to what I truly love, mis-guided mis- interpretations of Renaissance propriety. 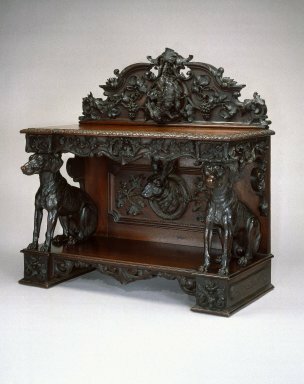 I’m particularly drawn to the hunt motif, the addition of a hare head of great interest to me. 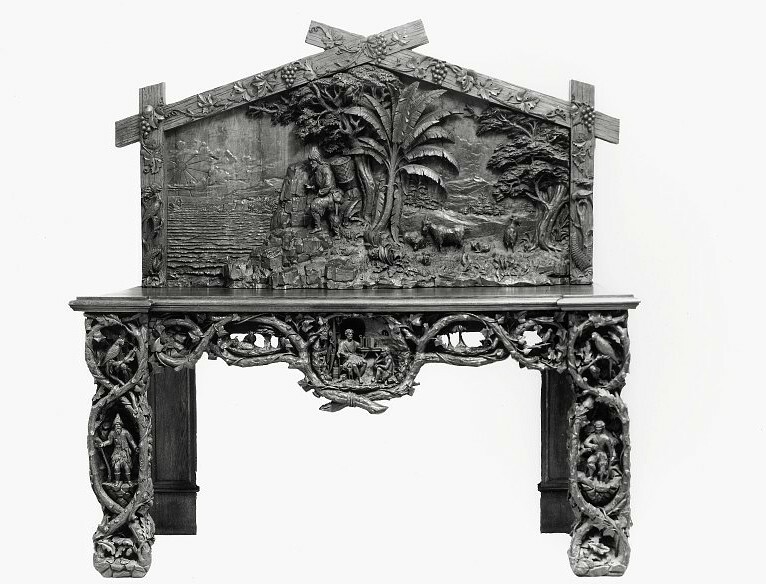 Another whimsical piece by Robinson, also in the V&A, a sideboard with the peculiar theme of Robinson Crusoe. This is apparently the first known piece by Robinson, with a quirky subject which he re-explores in a piece shown at the International Exhibition of ’62. I have to research that. To conclude I present another sideboard. also of the More Is Better school of design. 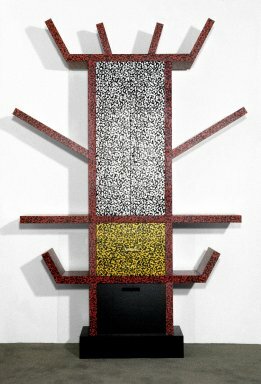 I first saw this piece in Philadelphia, soon after production. I am still ambivalent, but I still want it. 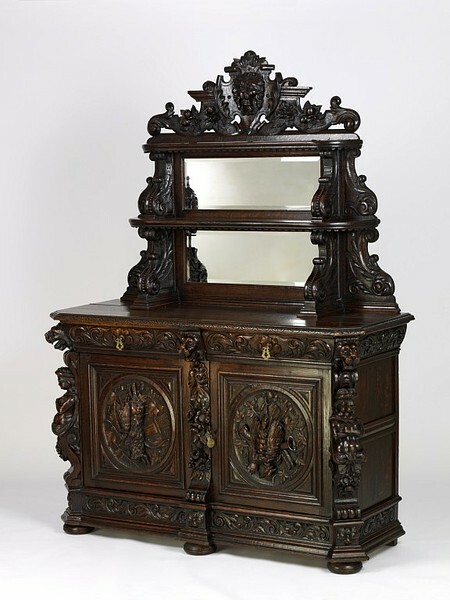 This entry was posted on June 4, 2010 at 7:23 am and is filed under 1851 Great Exhibition, 19th cent., furniture, Memphis, Renaissance Revival, Sambin, sideboards. You can follow any responses to this entry through the RSS 2.0 feed. You can leave a response, or trackback from your own site.